Below you will find a more than 100 Yiddish expressions, Yiddish proverbs and Yiddish sayings. This collection was compiled from a large selection of resources, if you have a Yiddish proverb, expression or saying not on this page please add it at the bottom of this page. Thank you. Happy reading. Skip to the bottom to add my favorite Yiddish Sayings and proverbs. Provide for the worst; the best can take care of itself. He who comes for the inheritance is often made to pay for the funeral. Hell shared with a sage is better than paradise with a fool. If a link is broken, the whole chain breaks. If a man is destined to drown, he will drown even in a spoonful of water. Weeping makes the heart grow lighter. Understanding is something we're sure the other fellow hasn't got. We have far greater compassion for another's misfortune than our pleasure in another's good fortune. What you don't see with your eyes, don't invent with your tongue. Send a fool to close the shutters and he'll close them all over town. The whole world is a big town. Treat me like a rabbi; watch me like a thief. Send a fool to the market and a fool he will return. Show a dog a finger, and he wants the whole hand. Show her the rudder, but don't steer her boat. Golden dishes will never turn black. Don't throw a stone into a well from which you have drunk. Measure the corn of others with your own bushel. When a thief kisses you, count your teeth. If you lie on the ground, you can't fall. If you seek a reputation for wisdom, agree with everyone. When fortune calls, offer her a chair. When luck joins in the game, cleverness scores double. Flattery sits in the parlor when plain dealing is kicked out of doors. Time and words can't be recalled, even if it was only yesterday. It is fun to pursues the language of other cultures and I hope you are enjoying these Yiddish Expressions. If you find one you really like you might consider putting one of these Yiddish Proverbs or Yiddish Expressions on a t-shirt, or apron or a number of other things. It is really easy to do. Just grab your favorite Yiddish expressions or Yiddish sayings and head over to zazzle.com to create your own way of expressing yourself. 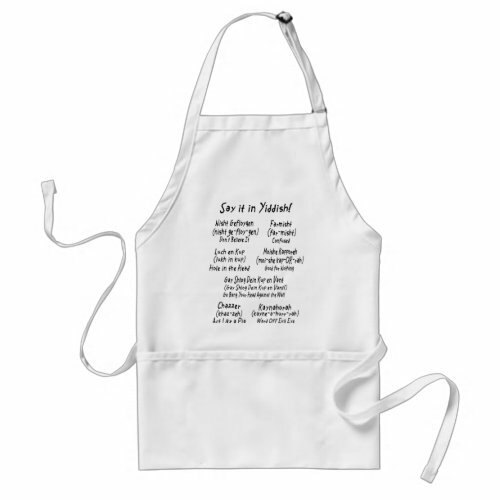 Below you will find a say it in yiddish apron made at zazzle. Skip to the bottom To add your own Yiddish Expressions and Yidish Sayings. Tomorrow your horse may be lame. A table is not blessed if it has fed no scholars. Charge nothing and you'll get a lot of customers. Hope may give a man strength, but not sense. If I dealt in candles, the sun wouldn't set; if I dealt in shrouds, people would stop dying. If the head doesn't work it's bad news for the legs. Charity and pride have different aims, yet both feed the poor. It is far easier to spot faults in another than virtues in oneself. It is the kindness and not the harshness in the headmaster’s voice that pushes tough boys to cry. Life is the cheapest bargain--you get it for nothing. God is an honest payer, but a very slow one. If each one sweeps before his own door, the whole street is clean. If rich people could hire other people to die for them, the poor could make a wonderful living. If Saint Paul's day be fair and clear, it will betide a happy year. Beware of still water, a still dog, and a still enemy. Bygone troubles are good to tell.” “Ca' me, ca' thee. Candlemas day, put beans in the clay; put candles and candlesticks away. Make no more haste than good speed. A good friend you get for nothing, an enemy you have to buy. Your pot broken seems better than my whole one. 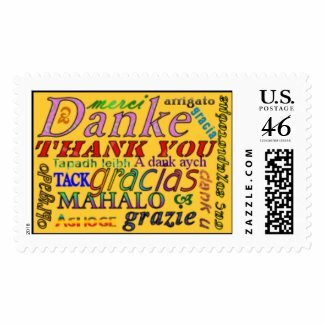 Another Great way to express yourself is to put it on a postage stamp when mailing out bills, greeting cards, or letters. Check out the yiddish postage stamp below and then grab your favorite Yiddish expressions and head on over to zazzle to create your own. Your health comes first; you can always hang yourself later. He that cannot pay, let him pray. One person enjoys a piece of hard cheese, a second a spun out prayer chant, and a third a door to the street. Prayers go up and blessings come down. A man is not honest simply because he never had a chance to steal. The glaciers didn't freeze overnight. The rich man who is stingy is the worst pauper. No man suffers from another's sins--he has enough of his own. A man should live if only to satisfy his curiosity. Love is blind; jealousy sees too much. Rejoice not at your enemy's fall, but don't pick him up, either. Some people are like new shoes--the cheaper they are, the louder they squeak! Love your neighbor, even if he plays the trombone. May God protect you from goyisha hands and yiddishe tongues. Money is round, so it rolls away. A penny is a lot of money--if you haven't got a penny. Golden dreams make men wake hungry. Had you gotten up early, you wouldn't have needed to stay up late. He falsifies who renders a verse just as it looks. You buy yourself an enemy when you lend a man money. The entire world rests on the tip of the tongue. Words show the wit of a man, but actions his meaning. The girl who can't dance says the band can't play. A rich man's foolish sayings pass for wise ones. Words should be weighed, not counted. A rich mouthful, a heavy groan. The longer a blind man lives, the more he sees. It has taken me some time to compile this list of Yiddish Proverbs, Yiddish expressions, and Yiddish Sayings. My goal is to have the best collection of Yiddish Expressions on the web. So, if you have a Yiddish proverb or saying you would like to add to this list please do so with the form below. Thank you. If you enjoyed this page on Yiddish Expressions and Yiddish Proverbs please share it with your friends. You can share this page on Facebook or Twitter with the buttons at the bottom of this page or if you would like to link to us from your website just click on the share this page link to get a text link for this Yiddish Expressions page. Return to ethnic expressions from Yiddish expressions.